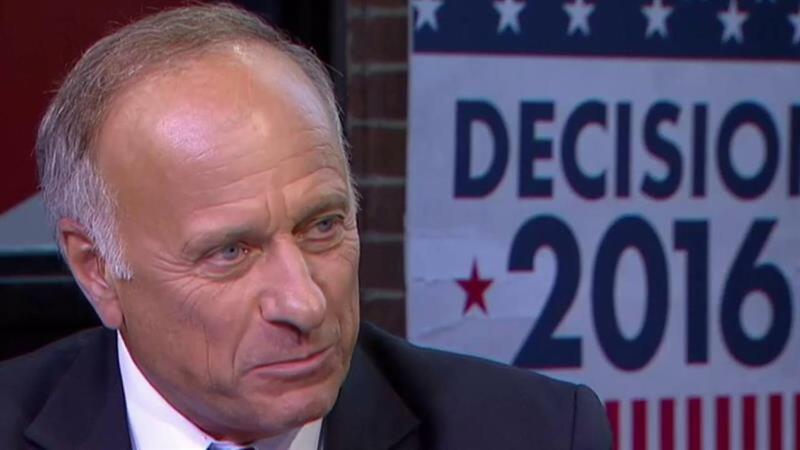 Rep. Steve King of Iowa made a controversial statement on MSNBC Monday night, claiming white people had contributed more to society than any other non-white "sub-groups." The GOP congressman was lamenting criticism of the party's largely white leadership when he challenged the other members of the panel, "to go back through history and figure out where are these contributions that have been made by these other categories of people that you're talking about. Where did any other subgroup of people contribute more to civilization?" Host Chris Hayes challenged him, "Than white people?" To which King replied, "than Western civilization itself. It's rooted in western Europe, eastern Europe and the United States of America and every place where the footprint of Christianity settled the world. That's all of Western civilization." Hayes ended the discussion quickly, saying, "We're not going to argue the history of Western civilization." The anchor tweeted about the comments after the show, saying he was "pretty taken aback." King is no stranger to racial controversy. In June the Iowa congressman filed a bill to block the Treasury Department from putting abolitionist Harriet Tubman on the $20 bill. According to Politico, he said it is "racist" and "sexist" to say a woman or person of color should be on currency. He added, "This is liberal activism on the part of the president that's trying to identify people by categories."